Builders of the RN MTBs, the RAF High Speed Launches and the Army Fast Launches, were also keen to develop fast craft for commercial and private use. In fact the development went hand in hand, many military designs resulting from those proposed for private use and vice versa - BPB certainly marketed craft as pleasure craft based on successful designs adopted by the PAF or other services. The craft named ADVANCE is a Ran, effect hydroplane, surface effect wing, trimaran. She was built by Cougar Marine and was designed by Peter Du Cane. She is the only one of her type and was originally powered by an outboard and could attain a speed of 90 mph. 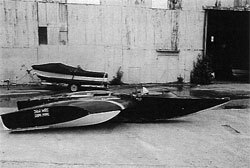 ADVANCE has very recently, December 2001, been rescued by Powerboat Restorations for inclusion in the collection at Marchwood.